Most gardeners understand the purpose of raised beds - to provide deep, fertile soil, and good drainage - but few take this idea to its full realization. The secret to doing so is by using the double digging method, also known as deep digging. Unlike what most gardeners imagine as a raised bed, it doesn't require wood, stone, or any other form of support on the sides. Deep digging is an approach to organic gardening that was developed in the 1960s and 1970s by well-known California gardeners Alan Chadwick and John Jeavons as part of Biointensive philosophy of food production. Most farmers and gardeners till their soil to a depth of no more than six or eight inches while the double digging method is geared to loosening the soil to a depth of 18 to 24 inches. The goal is also to avoid mixing the different layers of soil based on an understanding of soil science and the natural ways that healthy soil develops into distinct layers. By preparing the soil as deeply as possible, the theory is that less surface area is needed to produce the same amount of a crop. 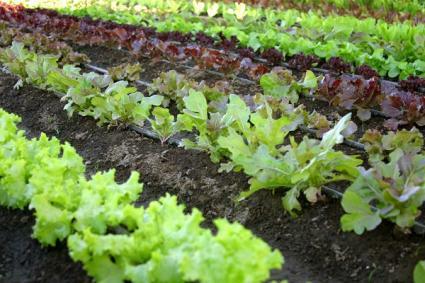 Studies by Ecology Action, the main organization promoting the Biointensive approach to food production, support the idea that deep (or double) digging is the most fertile way to create a raised bed. One study showed that the double digging method (combined with other strategies they've developed) resulted in 120 times greater productivity in broccoli crops than conventional farming techniques. Another showed that double digging rebuilds fertile topsoil at a rate 60 times faster than what occurs in nature. The University of Missouri Extension notes that double digging results in "an excellent rooting zone for plants". Double digging is a simple, systematic approach to making a raised bed. Mark off the area that will be used for the raised bed. You can use stakes and string to create a rectangular shape. Four feet wide beds allow the center of the bed to be reached from either side without stepping onto the loosened soil. Remove the sod or any other existing vegetation from the area. Using a spade, remove a 12-inch wide by 12-inch deep strip of soil from one end of the bed and pile it into a wheelbarrow. Loosen the soil at the bottom of the trench that was created with a digging fork to the greatest possible depth (without turning it over or mixing it). Spread several inches of compost on the bottom of the trench and gently work it into the subsoil with a digging fork while avoiding mixing the soil as much as possible. 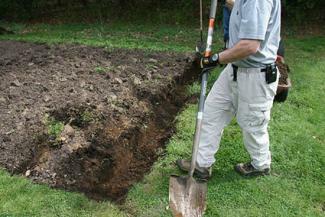 Remove another 12-inch wide by 12-inch deep strip of soil adjacent to the first one and deposit it in the trench. Try to let the soil slide off the shovel rather than turning it over, thereby avoiding the mixing of the soil as much as possible. Loosen the soil at the bottom of this trench and work a bit of compost into it as before. Repeat the process down the length of the bed removing each strip of soil and using it to fill the preceding trench, incorporating a two to three inch layer of compost into the subsoil of each one. After excavating the last trench at the end of the bed, use the soil from the first trench (that has been stored in the wheelbarrow) to fill it. Spread two to three inches of compost over the entire bed and gently work it into the loose soil, again trying to preserve the naturally occurring layers of soil. Smooth out the surface of the raised bed with a hard metal rake, breaking up any remaining clods of soil in the process. This process results in a raised bed that should remain extremely productive for years to come. 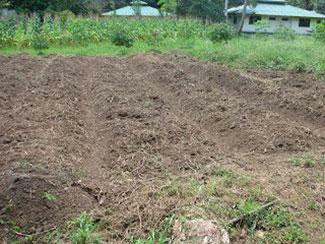 Each year the top layer of soil will have to be gently loosened with a digging fork to plant the crop. Refresh the soil at this time with a thin layer of compost to replace the nutrients removed by the previous year's crop. Every few years the entire process can be repeated as the lower layers will slowly become compacted again from the weight of the soil on top. One trick is to place a 2 by 12 plank across the row to stand on while working the soil of an existing double dug bed. This allows convenient access to the center of the bed without compacting the soil. Double digging is a labor intensive process, but it results in less work in the long term. You will need fewer beds to grow the same amount of food and only a light forking of the soil is needed each year to get the garden ready. Plus, the quantity and the quality of the produce are a worthwhile reward for the effort involved.